Several trials have confirmed that the pathological complete response (pCR) rates after neoadjuvant chemotherapy (NAC) are significantly lower in HER2-positive/ER-positive patients than in HER2-positive/ER-negative patients. To understand this phenomenon, we investigated the association between NAC resistance and CCND1, which is frequently overexpressed in ER-positive tumors. Pretreatment formalin-fixed tumor tissues were collected from 75 HER2-positive patients receiving NAC comprised anthracyclines, taxanes, and trastuzumab. Seventeen gene transcripts along with PIK3CA mutations were detected using MassARRAY (Sequenom, San Diego, CA). The gene expression levels were dichotomized according to the median values. The immunohistochemical expression of ER, PTEN, BCL-2, and cyclin D1 was scored. The relationship between the variables was assessed using the Spearman correlation. 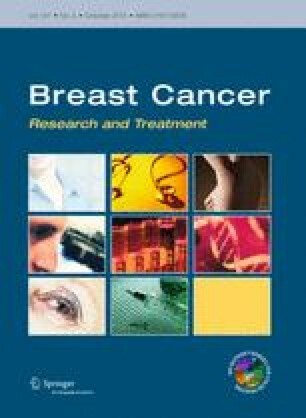 A logistic regression analysis was performed to detect predictors of pCR, which was defined as no invasive tumor in the breast or axilla. Forty-seven percent of the cases were ER-positive and 52 % (40/63 % in ER-positive/ER-negative) achieved a pCR. Among the ER-positive patients, the CCND1 gene expression level was 2.1 times higher than that in ER-negative patients and was significantly correlated with the expression of cyclin D1 protein. In a univariate analysis, a pCR was associated with high mRNA levels of ESR1, PGR, LMTK3, HER2, IGF1R, INPP4B, PDL-1, BCL-2, and CCND1 (P ≤ 0.05). In contrast, none of these genes were significantly correlated with a pCR among the ER-negative tumors and only EGFR was significantly correlated with a pCR. PIK3CA mutations or PTEN loss were not associated with a pCR in either group. After excluding ESR1 (r = 0.58), PGR (r = 0.64), and IGF1R (r = 0.59), the expressions of which were correlated with CCND1, a multivariate analysis revealed that CCND1 [P = 0.043; OR, 0.16] and HER2 [P = 0.012; OR, 11.2] retained its predictive value for pCR among ER-positive patients, but not among ER-negative patients. A High Level of CCND1 gene expression is a poor predictor of a pCR and provides a rationale for evaluating CDK4/6 inhibitors in HER2-positive/ER-positive breast cancer patients. Dr. Hironobu Minami has received an unrestricted research grant and honoraria for his activities as a speaker and a member of the committee for clinical studies from Chugai Pharmaceutical, the manufacturer of trastuzumab. The other authors have declared no conflict of interest. The study protocol was funded by research Grants from the Daiwa Securities Health Foundation.